My map is inspired by the many moves our family has made in the last 16 years. When my husband joined the Army, we were living in the Washington DC area. Since then, I chose to relocate to Los Angeles, and then we've moved (mostly together) to Germany, to Arizona, back to Germany, to Hawai'i, and next, on to Virginia. Each place has it's landmarks and it's charms. Thinking of each these places reminded me of illustrated (and often embroidered) souvenir tea towels and pillows representing the US states. They may not strictly be maps in the wayfinding sense, but they include sights and cities associated with a state, and in that way provide an inspirational map of what can be found in a particular place. Mine shows our movement from one place to the next. 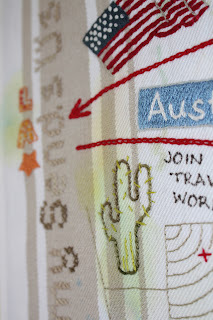 Embroidering something for one's home brings to mind those nesting sensibilities we all have when moving house, especially when it's an item for that most essential of places in each house -- the kitchen. I wrote a little more about the inspiration in a previous post here. My embroidered towel is mounted on a quilted background reminscent of a potholder. From a practical standpoint it provides a bit of structure, from a conceptual standpoint it makes another reference to home and kitchen, and from a tongue in cheek standpoint it pokes a bit of fun at the fear many art quilters have that our smaller quilted works will be mistaken for fancy potholders. Oh, I love the way this really does bring to mind the vintage tea towels. I love them. Your motifs are so varied and well done! 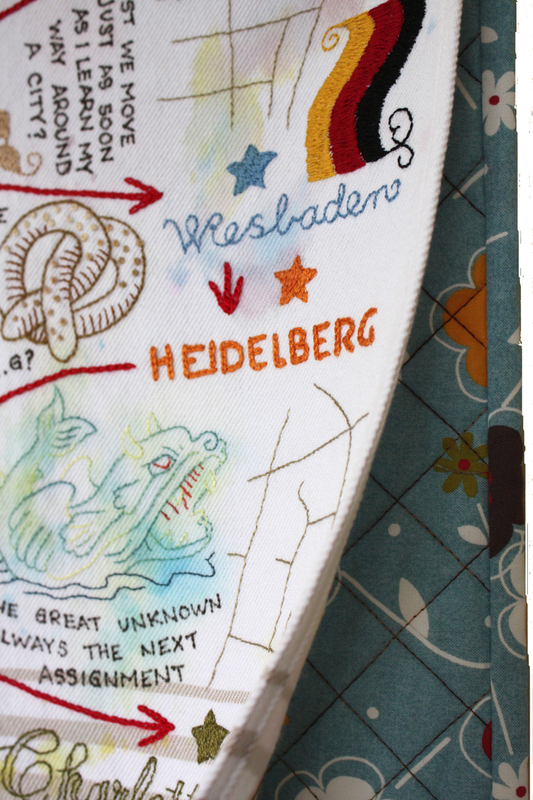 But what I really like is the tongue-and-cheek reference to the pot holder! You know, I once gave someone a miniature amish bars quilt that I made. I TOLD them it was not a potholder, but guess what? That was how they used it. Mental note: No more quilts for that family. This reads as a souvenir of your life to me Kristin, and what an interesting one it is. All the little personal symbols make it special. This begs to be seen up close and personal, like so much of your work. You have done a lot of work on this that represents a big part of your life as the army wife. As with Karen, I appreciate how you are staying with a theme in your art work. Very cool!! My first thought of your piece is it is like a scrapbook. 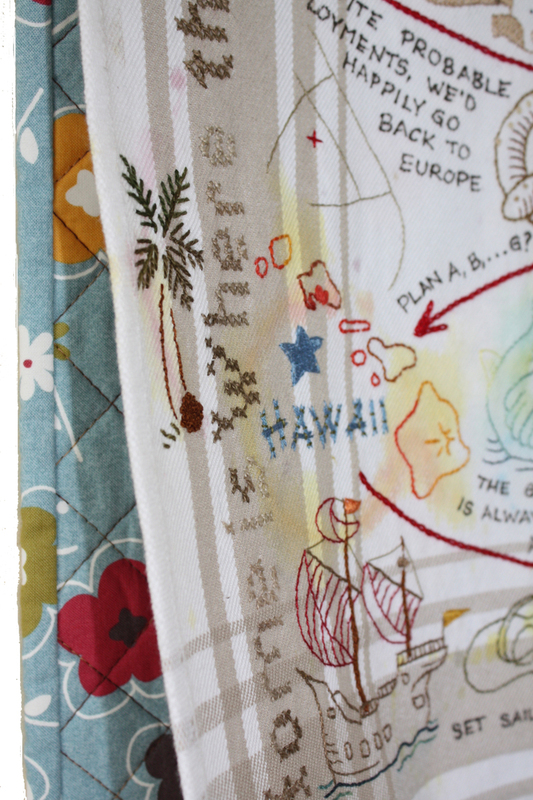 It tells the story of your families' travels and this is a great way to document it. At first glance, this looks like an elaborate napkin doodle but it is so much more than that. Like a map, it calls to be studied and pored over. Great idea and brilliantly executed. Until a couple of weeks ago, this is exactly what my quilt was going to be about! Then I saw a glimpse of yours and realised what you were doing. Mine hadn't even begun to form as an image in my head so I moved to something different but , oh, this is what I WISH it had looked like! I LOVE your quilt, Kristin. LOVE it! The tea towel base is a stroke of genius. 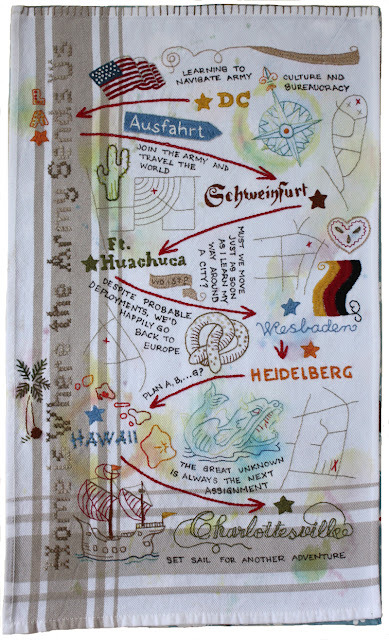 I really like how you documented moving all over the world and the arrows flying from place to the next. I would love to see all the details up close, but when I try to click on the photo or zoom in it just get fuzzy. You may be the queen of irony, Kristen. Common domestic forms and cheery images that manage to convey the very serious business of life and love. So effective at delivering that punch of recognition and realization that we all travel roads that make us who we are and bring us, at last, to who were were always meant to be, regardless how meandering that path may be. Wonderful. So wonderful. Kristin, I think this is very successful. It reads like a souvenir towel at first but it has a great edge to it, with lots of wonderful detail to explore. I will look forward to seeing this in person! 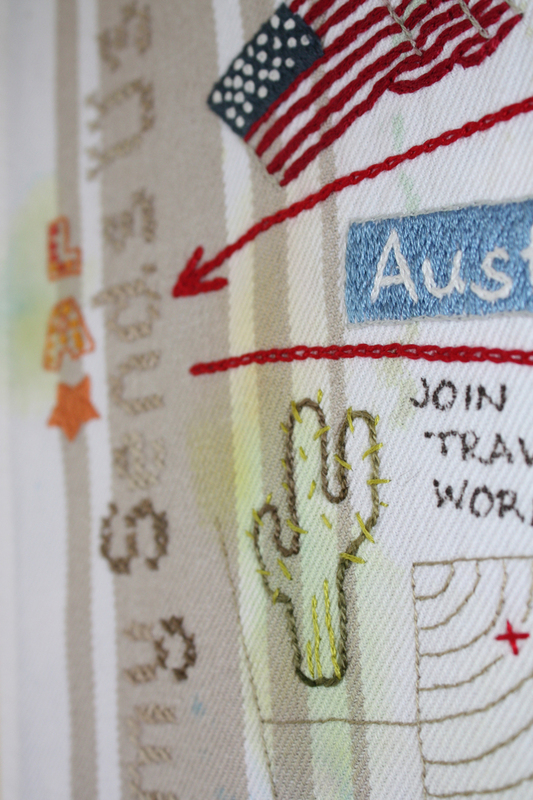 Such lovely lovely stitching! I considered a very similar theme and I even cut out stencils for the 10 states I've lived in, but I think I found the topic too complicated to explore honestly. You did an amazing job. My favorite elements are the repeated simple street maps with the location of your home in each city. I also love the "stains" that you would find on a dishcloth. They add lots of dimension to the piece. Bloom where the army plants you! That is how we were indoctrinated as we moved between Army assignments and I think your quilt brilliantly illustrates that. I sooo can relate to it! We also walked much of the same ground albeit probably 20 years apart. Germany is where I met my husband and it was the beginning of a 28 year adventure around the U.S. and Europe for this French girl until we retired outside of Ft Hood, TX. As I literally "read" your quilt, I can tell the rebel in you! I love it and wish you the very best on your next assignment. I just love this! What a great idea. 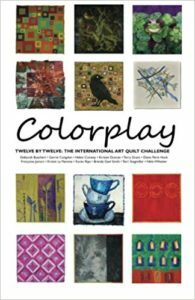 I just found this blog because a quilter in my quilting book club would like to start a similar project. Great inspiration. Thanks for sharing! The work involved! Why has noone commented on the work involved in this?!! It must have taken ages. i like that it is a quilt thay can be read. Would you consider a bigger version with more information about your stays as par of your army wife series I wonder? I love this piece Kristin. One of my British friends used to sew and embroider a cushion each time she moved with her family, (and she moved many times). The idea of the "potholder" behind the towel is great too! Website Update - All Mapped Out!